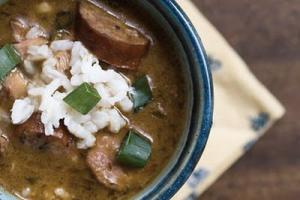 In New Orleans lingo, Gumbo Ya Ya means everyone talking at once, usually at a large gathering or party. Making a roux is tricky and will take a lot of time to get to the desired color. However, a properly cooked roux is the backbone of this dish and once mastered, you will love using it in all types of gumbos, soups and stews. Open one can of beer and sip while cooking; you’re going to need it. Begin making your roux by preheating a thick pot using medium to low heat. Pour in the oil, then add the flour gradually while stirring constantly with a spoon. Your arm will get tired, but continue to stir until your roux is the color of chocolate. Too high heat will cause the roux to speckle and burn. Use caution because the roux mixture becomes very hot and can burn like napalm. When your roux has reached the desired color, add the bell peppers, onions and celery and stir until it smells wonderful, about 30 seconds. Slowly pour the stock into the roux, stirring constantly to prevent lumps. Use caution as this process creates a lot of steam. Add your 2 remaining cans of beer and all remaining ingredients except for the chicken and rice. Bring to a boil. Simmer gumbo, uncovered, about an hour, skim any fat and stir occasionally. Add your chicken during the last 15 minutes of cooking. 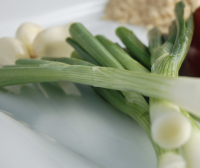 Serve over cooked white rice and garnish with thinly sliced green onions. Enjoy!